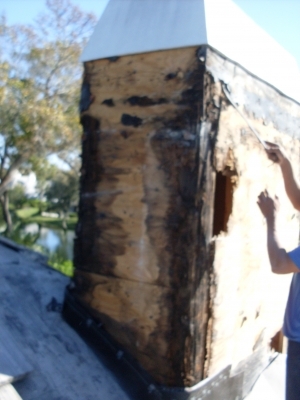 Structural damage: Roof Repairs Only is both a state licensed Roofing and General Contractor. 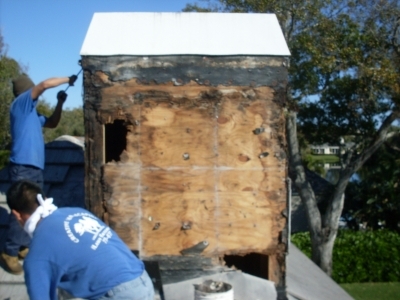 If you have a chimney or any other roof related problem that has deteriorated to the point of needing structural support removal and replacement, we can handle the entire job quickly and professionally. Images of fake wood chimney: This chimney structure was reportedly constructed with the original house, somewhere between 1979 & 1982. The original roof was cedar shake shingles, around 2001 the house was re-roofed with concrete tile. Reportedly and quite typically, the homeowners were worn thin from repairing the roof around the chimney structure. They were convinced, with the new tile their roof leaks around the chimney would be history. In 2011, we unfolded the 30 year old mystery, the roof was not the source of the problem, it was the chimney structure itself. In these pictures please take notice, the stucco top was kept in tact. From the termination where you see the stucco stopped, began a series of protruding bands, that is where the water began it's destructive point of entry. We can make this determination on a chimney structure that is newly constructed or 30 years later, the difference is thousands of dollars. Like any maintenance item, early detection from a trained source, will save you money, not cost you. Our cost for detection? Nothing! Your phone call will be reciprocated with a free visit to your building by either one of the owners, or a trained source, trained and supervised by the owners.